Certain that his brother’s death is murder, young farmhand Beobrand embarks on a quest for revenge in war-torn Northumbria. When he witnesses barbaric acts at the hands of warriors he considers his friends, Beobrand questions his chosen path and vows to bring the men to justice. Relentless in pursuit of his enemies, Beobrand faces challenges that change him irrevocably. Just as a great sword is forged by beating together rods of iron, so his adversities transform him from a farm boy to a man who stands strong in the clamour and gore of the shieldwall. As he closes in on his kin’s slayer and the bodies begin to pile up, can Beobrand mete out the vengeance he craves without sacrificing his own honour … or even his soul? The Serpent Sword is the first novel of the Bernicia Chronicles. 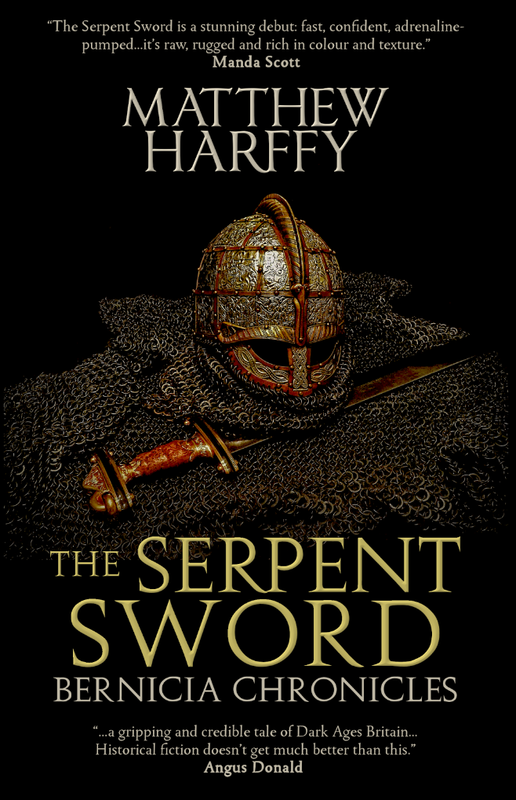 The Serpent Sword is the debut novel of Matthew Harffy, and it is the first installment of Bernicia Chronicles. I expected less than it had offered, but Harffy’s writing is excellent, easy to understand and matches the setting of the story. It kept me interested and had me turning pages. For a debut author, Harffy did a great job in his character development, refining a farm boy into a warrior. This is where some readers often focus on a first installment of a series, and I agree that it’s very critical. On the other hand, I can’t seem to avoid comparing this novel from other authors’ works, like Bernard Cornwell’s The Warrior Chronicles, also set in England. Although set in the late ninth century, it also has a place called Bebbanburg (now Bamburgh Castle). Harffy said that he started writing The Serpent Sword before Cornwell even published the first book of the said series. Considering I’ve been reading those saxon novels, this book felt like reading a prequel, which can either be a good or bad thing, depending on what other readers think about both works. Also, there’s a sword in the book with the name “Hrunting,” which may be familiar for those who have read the Old English epic poem “Beowulf.” They might or might not be the same sword, but this is fiction, so anything is possible. Beobrand often dwelled on his past that he could be sometimes irritating. The head-hopping of POVs is a bit of an issue, but tolerable, since it’s well-written in third person. Pacing is average—not too fast and not too slow—but there are some situations I just find monotonous. The most important thing: it lacks a little on the side of humor.